Oval Gear Flow Meter are positive displacement flow meter with a mechanical display, designed to cover a brand range of industrial fluid measurement applications. 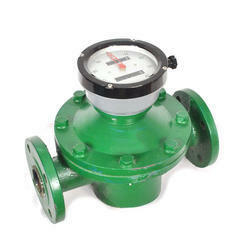 Oval Gear Flow Meter are designed for low flow and high accuracy.These Meters are great for viscous fluids. We are engaged in providing a wide gamut of Gear Wheel Meter. Due to our enormous understanding and massive knowledge of this business, we are involved in offering Oval Gear Flow Meter. OGFM Oval Gear Flow meter: the main type of positive displacement Flow meter, is used in a wide variety of applications including measuring of boiler fuel oil and diesel oil, as well as for transactions for kerosene, light oil and veavy oil. 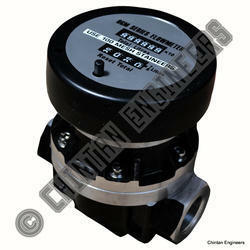 it is design for metering a variety of High Pressure, Low Corrosive liquids. The Oval Gear Flow meter is a kind of Positive Displacement Flow meter. As the fluid being measured passes through the meter, it rotates 2 oval gears in measuring cavity to displace a precise volume of fluid. A sensor detects the gear rotation to determine displaced volume and flow rate. The measurement element of this positive displacement oval gear meters consists of two precision oval gears. The revolution can be sensed by a magnetic-field-controlled pulse generator, resulting in only two moving parts i.e “oval-wheels. These oval gear meters can be used for application of nearly all operating condition. Max Gear meters are both economical and rugged. High pressure design, ±0.3% of reading accuracy and 100:1 flow range or more. A gear meter is an ideal choice for fuel oil measurement, hydraulic test stands, hot melt adhesives or conformal coatings. We are the Manufacturer and Supplier of Electronic Oval Gear Flow Meter.